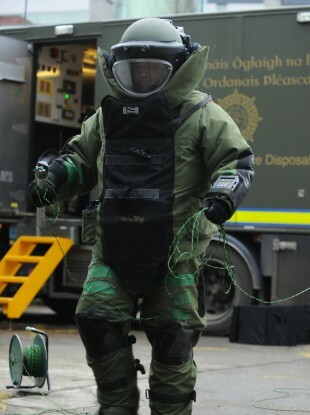 A TEAM OF army bomb disposal experts rendered safe a viable improvised explosive device (IED) in Cork City this morning. An Garda Siochána requested the Army Bomb Disposal Team after a suspect device was found in a private residence in the Knocknaheeny area of the city. The team arrived at the scene at 10.20am. A cordon and traffic restrictions were put in place for public safety and a number of houses were evacuated during the operation. A controlled explosion was carried out at the scene to render the IED safe. The device was then removed to a military location for further testing and the scene was declared safe at 12.30pm. Email “Houses evacuated in Cork after homemade bomb is found”. Feedback on “Houses evacuated in Cork after homemade bomb is found”.